Answer to your question is 4.7mm (any between 4 and 5 will do). Its the DPL-7 line from Teufelberger (if its the same as Duotone/North). What do you do then? You replace only the snapped line? Or two lines? Or all four? well first of all I swim back to shore then if one snapped I replace one if two snapped I replace two and so on. Went swimming today in fact. If the lines get too fuzzy I will throw them out even if they haven't snapped yet but I can typically tell just how close a line set is to being completely finished and not worth keeping. I could tell these chicken lines were about ready to go but rode anyway and sure enough they both snapped. Ok. I had never snapped a line in several years of kiting until now. I guess mainly because I was selling and buying kites usually with bar included. Weird thing, I snapped three lines at the same time. I snapped one steering line, the center line and the flagging line. I unhooked, my kite stalled and fell right into the power zone, when it regained power, it pulled violently and snapped all three lines. The bar is a North trust bar four lines. I was riding a 10m dice in about 20 knots. The bar had several seasons of use. At this point, having to replace three lines and not being sure about how much life is left on the remaining three lines, I don't know whether to replace the lines or get a new bar. Are you made of money? then get a new bar. Are you cheap? New lines please! Check your lines regularly and definately change them on any sign of excess wear. We stock all kinds of (kite) ropes and parts and we can make you any custom setup in our repair loft. Interesting to note where my lines snapped. The long steering line snapped right on a knot that had been there long and I neglected, very close to the attaching point with the kite. 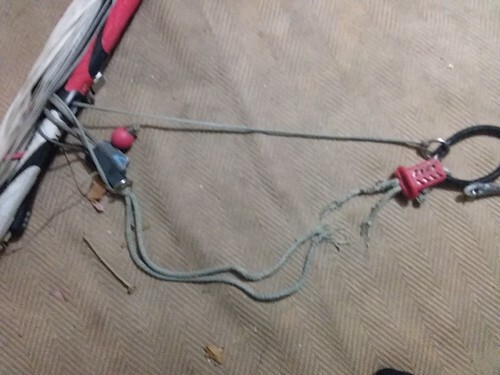 Both the flagging line and the center line snapped at the point where the splicing ends and the rope regains its regular section. The flagging line on the ring side, where it attaches to the leash. The center line in its high point, where it connects with the two center long flying lines.